NEW YORK (AP) The New York Knicks stopped their slide with an impressive performance on both sides of the court. Especially in the third quarter. Tim Hardaway Jr. scored 25 points, and the Knicks snapped a nine-game losing streak with a 124-101 win over the Charlotte Hornets on Saturday night. New York had five players in double figures in its highest scoring game of the season. Frank Ntilikina had 15 points, Trey Burke scored 14 and Troy Williams finished with 13. The Knicks outscored the Hornets 42-17 in the third. Charlotte was just 4 of 23 from the field in the period. 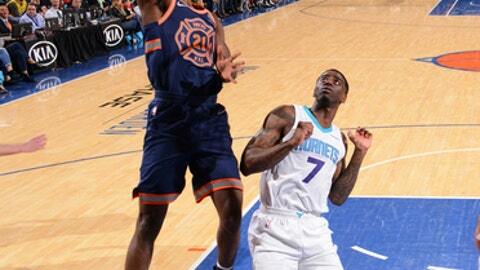 Dwayne Bacon led the Hornets with 15 points, and Dwight Howard finished with 14 points and 13 rebounds. The Hornets shot 36.7 percent (33 for 90) for the game. Kemba Walker made a 3-pointer to get Charlotte within seven with 7:15 left in the third. But New York closed the quarter with a 32-7 run. Ntilikina made two foul shots, Hardaway connected from beyond the arc and Isaiah Hicks hit a jumper to give the Knicks a 99-67 lead heading into the fourth. Hicks finished with 12 points on 5-for-5 shooting. New York led by as many as 38 at 105-67 with 10:40 remaining. Frank Kaminsky and Malik Monk each scored 12 points for the Hornets, while Walker and Marvin Williams finished with 10 apiece. It was the Knicks’ first win since a 120-113 victory at Orlando on Feb. 22. Hornets: Howard is the only Hornet to play in each of the team’s 70 games this season, and he has started every one. Howard scored at least 30 points in three of his previous five games. Knicks: Courtney Lee was away from the team to attend to a personal matter. Lance Thomas replaced him in the starting lineup. Willy Hernangomez, who was traded from the Knicks to the Hornets on Feb. 7, played against his former team for the first time. He finished with nine points and six rebounds in 13 minutes. The Knicks have allowed their opponent to score at least 100 points in 16 straight games. They are 2-14 during that stretch. The last time New York held an opponent to less than 100 points was a 99-96 loss to Atlanta on Feb. 4. Hornets: Visit Philadelphia on Monday. Knicks: Host Chicago on Monday.